Jury duty is a service to your community. However, there has be a better way of doing it. I just got my check for spending two days sitting around last week- doing nothing. And that was the same for approximately for 100 people called in Tuesday last week. The check was for $36 bucks YEE HAW! We went in and sat down and learned everything that we were supposed to do, and then 12 at time, they took potentials into the jury box to be questioned. That was only the second half of one day- they finished up the first day to inform us we would be needed another day. We learned on the second day after sitting for the better part of a good morning that we were not needed because of procedural and legal issues dealing with the case at hand. It's very frustrating to find the when you want to give back, but you can't. Jury duty is something we're supposed to do but they make it so difficult, so time consuming and such a chore. No wonder nobody wants to do it and they do everything they can figure a way out of it. 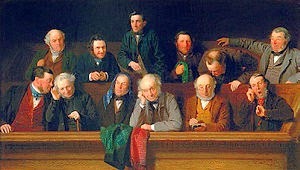 (Reminds me of a joke, do you really want to be judged by a panel of people too inept to get out of jury duty?) I probably had no logistical reason not to serve for more than two days, except had the case run much longer it would have interfered with family appointments. Hardship is allowed to be used to get you out of court. The 77 year old woman who could barely stay awake because of her medicine, you probably don't want her, but the single dude who claimed that he was a salesperson and it was robbing him? Why couldn't he stick it out? I really wanted to serve in the jury box, and now I am out of the loop for two years. They reminded us OVER and OVER, don't forget you DON'T have to serve for two more years! If I get summoned, I'll still show up next time, but not for the $36. PS click through below, the cat story is hilarious!